Six Truman student-athletes have been recognized by ESPN The Magazine for their academic records. Swimmers Kate Aherne, Andrew McCall and Tanya Sylvester, along with tennis team member Peter Bracha and track and field’s Katrina Biermann, were all named 2010 ESPN The Magazine Academic All-Americans. Biermann was also selected with Jacob Schrum to the Academic All-District Track and Field first team by ESPN The Magazine. The announcements were presented by the College Sports Information Directors of America. Aherne repeats as a first-team Academic All-American after winning the award in 2009. She won her third straight 200 IM national championship at the Division II Swimming and Diving Championships in March and finished her Truman swimming career with 27 All-America honors. McCall was a 2010 Rhodes Scholar and the first in the history of the University. He was named the Truman Male Student-Athlete of the Year at the department’s annual awards banquet. Sylvester moved up to the second team this year after garnering third-team Academic All-American last season. She earned five All-America awards at the 2010 Division II Swimming and Diving Championships. Bracha picked up his second straight Academic All-America honor, having been named to the third-team squad in 2009. He is a three-time selection to both the MIAA Presidential Scholar list as well as the Academic All-MIAA team. Biermann was the 2010 Division II Indoor Pole Vault National Champion. She was also the MIAA indoor and outdoor pole vault champion and broke both indoor and outdoor school records in pole vault and triple jump. She was the co-winner of the Truman Female Student-Athlete of the Year Award with Aherne. Schrum placed fourth in the 800 meter run at the 2010 MIAA Outdoor Track and Field Championships. He earned the Dean’s Academic Recognition Award for being the top male student-athlete in 2010. To be eligible for Academic All-America consideration, a student-athlete must be a varsity starter or key reserve, maintain a cumulative GPA of 3.30, have reached sophomore athletic and academic standing and be nominated by his or her sports information director. The Bulldogs entered the 2009-2010 academic year ranked 24th overall and second in Division II in award recipients. Secretary of State Robin Carnahan recently announced Pickler Memorial Library received a Missouri State Library Spotlight on Literacy Grant in the amount of $10,000. The grant will be used to support the Children’s Literature Festival to take place on campus in April 2011. The primary goal of the Festival is to promote literacy in children in grades 4-6 in Northeast Missouri by stimulating their interest in reading and literature. The Secretary of State’s Missouri State Library Excellence in Library Service Grants are funded by the Library Services & Technology Act through The U.S. Institute of Museum and Library Services, which is the primary source of federal support for the nation’s 122,000 libraries and 17,500 museums. The Institute’s mission is to create strong libraries and museums that connect people to information and ideas. So far, during this fiscal year, the Missouri State Library has approved a total of 144 applications that have distributed $1,395,613 in federal grant awards to libraries. To find out more about Missouri’s Secretary of State’s office, visit http://www.sos.mo.gov. Truman basketball great Harry “The Horse” Gallatin was enshrined as part of the inaugural Mid-America Intercollegiate Athletics Association Hall of Fame class at the league’s awards banquet in Kansas City in June. Gallatin, the only Truman alumnus who has played in the NBA, starred for a decade on the professional level. He performed nine seasons for the New York Knicks and his final year for the Detroit Pistons. At that time, he held the NBA record for consecutive games played (746) and was selected to compete in the first seven NBA all-star games, a feat only two other players, Dolph Schayes and Bob Cousy, can claim. While a member of the Knicks, he was dubbed “The Horse” because of his durability, aggressiveness and hard work. As a Bulldog, he earned all-conference accolades in 1946-47 and 1947-48 and was a NAIA All-American in 1947-48. During Gallatin’s collegiate career, Truman won 59 of 63 games, notched a pair of league titles and made two trips to the NAIA Tournament in Kansas City. Gallatin also competed in baseball while at Truman. When he first started his professional basketball career, he also played four years of baseball in the Chicago Cubs organization. After his retirement from professional basketball in 1958, Gallatin was appointed basketball coach at Southern Illinois-Carbondale, where he logged a four-year record of 79-36. He was hired to guide the St. Louis Hawks of the NBA, leading them to a 48-32 record in his first season at the helm. Gallatin was named 1962-63 NBA Coach of the Year. After a three-year stint with St. Louis, Gallatin returned to New York, this time as coach. In 1967, he became Dean of Students at Southern Illinois-Edwardsville, near his hometown. Gallatin coached basketball for two years and served as athletic director for five years. He took a full-time teaching position in 1972 at SIUE. Gallatin was inducted into the Basketball Hall of Fame in 1991 and is also a member of the Truman Athletics Hall of Fame, the Missouri Basketball Hall of Fame, the Illinois Basketball Hall of Fame and the NAIA Hall of Fame. His Bulldog No. 44 jersey was retired on Jan. 20, 2001. Volunteers are still needed for the 9-11 p.m. shift for Truman Day at the NEMO Fair. Volunteers will receive a free one-day pass to the fair. Call the Public Relations Office at 785.4016 to sign up or stop by McClain Hall 101. The ID Office has moved to Missouri Hall 1100. For more than 60 years, the federal government-sponsored Fulbright U.S. Student Program has provided future American leaders with an unparalleled opportunity to study, conduct research and teach in other countries. Applicants to the Fulbright U.S. Student Program must be U.S. citizens at the time of application and hold a bachelor’s degree or the equivalent by the beginning of the grant. Professional applicants lacking a degree, but with extensive professional study and/or experience in the field in which they wish to purse a project, may also be considered. 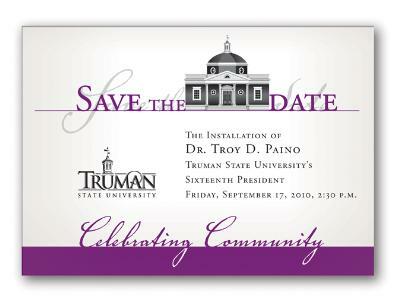 For more information visit the Learning Technologies website at http://ltt.truman.edu. Pickler Memorial Library, along with ITS, is hosting a presentation on Institutional Digital Repositories by consultant Beth Warner. The presentation will take place from 2-4 p.m. July 15 in the Alumni Room of the Student Union Building. The Truman Tennis Courts are expected to be closed in July and August while the courts are resurfaced and the fence is replaced. The next issue of the Truman Today will be available online July 26 and in print July 27. All submissions should be made by July 21 to tmiles@truman.edu. Taner Edis, associate professor of physics, presented a paper entitled “Pseudoscience in the Periphery” at the Science and Technology in the European Periphery conference in Galway, Ireland, June 19. Jason Miller, professor of mathematics, was elected by the National Conferences on Undergraduate Research (NCUR) to serve as their chair starting July 1, 2010. He will serve for a year or until NCUR and the Council on Undergraduate Research (CUR) merge, at which point he will serve a three-year term on CUR’s Executive Board.